Over three days in May, 2013, the Oregon Immunization Program participated in an exercise in emergency preparedness called PACESetter. It began in Atlanta and reached all the way up to Washington State, involving federal, state, tribal, county, city and private agencies. We were presented with the simulated scenario that bioterrorism and other attacks were made against citizens in five Oregon counties as well as Clark County in southern Washington. The intent was to respond to these simulated attacks exactly as we would in real life and to test our ability to share information not only across jurisdictions in Oregon but also across state lines with Washington. In response, the Centers for Disease Control and Prevention (CDC) shipped medical supplies that we received at Oregon’s Receipt, Stage and Storage (RSS) area. 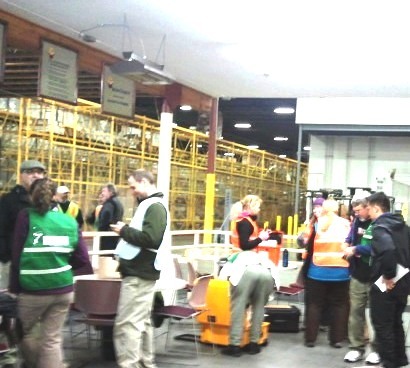 Our team helped unpack and redistribute the supplies to Oregon’s impacted counties. We also activated our Agency Operations Center (AOC), which acts as the command center where planning, operations and logistics such as requests for federally funded medical supplies are coordinated and documented. The RSS area works as a well-oiled machine with staff efficiently breaking down large pallets of material, including items from our Strategic National Stockpile (SNS), into smaller lots to be distributed where they’re needed. The AOC, on the other hand, is more like carefully controlled chaos with information coming in constantly that changes the scenario and the required response. In addition, the exercise planners always throw in unexpected events or additional threats that change the game to make sure participants are nimble and able to switch gears as needed, which is exactly what would be likely to happen in a real attack. This exercise was a full-scale exercise (FSE), meaning that we used all aspects of the state and local agencies’ planning and response resources, from immunization program staff to emergency management staff to medical response teams, state partners and even the governor, who had to declare a state of emergency (a fake one, of course). We are required by our CDC federal emergency preparedness grant to conduct an FSE every five years. The purpose of any emergency preparedness exercise is to ensure that the state’s public health and medical services can respond to a complex public health incident quickly and effectively, mobilizing teams that are prepared and well-trained. Our goal in these exercises is just as it is in our everyday work: to improve the lifelong health of Oregonians through our vision of a healthy Oregon.